Want to talk about how we might work together? Thanks to our active partnerships with companies, organisations and kind donors we can continue to exhibit and collect world-class design and deliver nationally-recognized educational programmes to new generations. We welcome new partnerships with companies and organisations, for anything from a multi-year relationship to a single event like an exhibit or an educational programme. We want “Associated with Designmuseum Danmark” to be a seal of quality. Cooperation with BMW and designer Alfredo Häberli made the 2016 exhibit “Spheres – Perspectives in Precision & Poetry for BMW” possible. 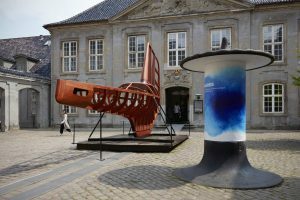 The exhibit offered an artistic and radical scenario for how transport might look in the future. 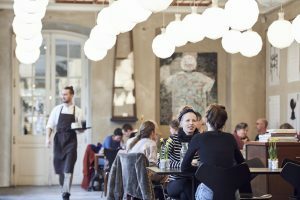 Our partners contributed to the unique atmosphere in our café: Le Klint with the classic “Frugtlygte” hanging lamps drawn by Kaare Klint in 1944. Iiattala/Fiskars provided tableware to the café. Fritz Hansen contributed Arne Jacobsen’s chair Grand Prix, first produced in 1957.